• You will need cardboard tubes from toilet paper, paper-towels, plastic or tinfoil wrap, rubber bands and waxed paper. • Use scissors to cut a 5” square of waxed paper. Place the square of waxed paper on one end of the tube and secure it with a rubber band. 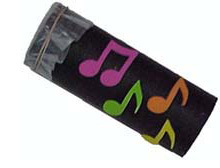 • To play your homemade kazoo, gently hum into the open end! Start your own band! This is an easy way to make a guitar using an old shoe or tissue box, rubber bands, scissors, a paper-towel tube, and a pencil. • Find an old shoe or tissue box, or other cardboard box. • Have an adult cut an oval-shaped hole in the top. • Stretch a few rubber bands around the box and over the hole. • Put a pencil under the rubber bands on one side. • Tape on a paper-towel tube and decorate the box. A creative way to recycle water or soda pop bottles while making a musical instrument. • Find small water or soda pop bottles, dry pasta noodles, rice, glitter or sequins, markers, tape or glue, and ribbon. • Fill the clean, dry water or soda pop bottle 1/4 – 1/2 full with pasta noodles, rice and glitter. • Then tape (or glue) the lid on. • Next, tie a ribbon around the neck of the bottle. • If you want, decorate your bottle with markers, sequins, glitter, and more ribbon. No celebration is complete without tambourine music! • Ask mom or dad for some paper or plastic plates, jingle bells,curling ribbon, scissors, a hole punch, string or yarn, crayons, markers, and paints. • Take a plate and decorate both sides with crayons, markers or paints. Be creative! • Punch holes all around the paper plate. • Push the base of a jingle bell through each hole stringing a piece of yarn through each and tieing it in place. Put as many bells on it as you want. Remember the more bells there are the more noise it will make! • Tie curling ribbon in one of the holes and curl with scissors (you may need a parent to help with this). Shake in your hand to hear the wonderful jingle! Go to the parade and make some noise with your own finger cymbals. • To make your cymbals you will need two clean, frozen juice or baby food jar lids, or other small jar lids, hammer, nail, masking tape, pipe cleaners or ribbon, markers, paints, and stickers. • Have an adult hammer 2 holes in the middle of the lids using a nail. • Place a small piece of masking tape on each side of the lids to make sure no one will cut their fingers. Then make a hole through the tape. • Place a short piece of pipe cleaner or ribbon through each hole. Twist or tie at the end. • Decorate using markers, paints or stickers. • Place a finger through the pipe cleaner or ribbon on one lid and a thumb through the other and make some music! Create some rhythm with your very own drum. • To begin creating a drum you will need an empty oatmeal container with lid, yarn, pen, 2 pencils, 2 spools (optional), construction paper, crayons, markers or paint. • Before beginning, you can decorate the oatmeal container with construction paper, crayons, markers, or paint for a colorful effect. • Place the cover on the container. Use a pen to make a hole in the center of the cover and in the center of the bottom. • Through these holes, pull a piece of yarn long enough to hang around child’s neck and down to their waist. Tie the two ends of yarn behind child’s neck. • Use the pencils as drumsticks, or you may place the spools at the ends of the pencils, and secure with glue if necessary.